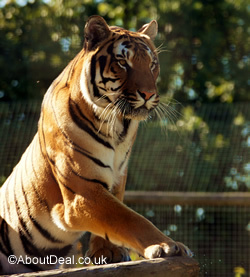 This 100 acre wildlife park has elephants, gorillas, rhinos and a huge range of other animals. There is a cafe, a restaurant and a large gift shop as well as the Treetop Challenge. You’ll need a full day to do justice to all that is on offer here. This entry was posted on Wednesday, February 28th, 2018 at 11:45 am	and is filed under Attractions, Tourism. You can leave a response, or trackback from your own site.